Between the 12th and 14th centuries, Timbuktu's population grew immensely due to an influx of Tuaregs, Fulanis, and Songhais seeking trade, security, or to study. By 1300, the population increased to 10,000 and kept increasing until it reached about 50,000 in the 1500s. These descriptions and passages alike caught the attention of European explorers. Africanus, though, also described the more mundane aspects of the city, such as the "cottages built of chalk, and covered with thatch" – although these went largely unheeded. Shabeni stayed in Timbuktu for three years before moving to a major city called Housa several days journey to the southeast. Two years later, he returned to Timbuktu to live there for another seven years – one of a population that was even centuries after its peak and excluding slaves, double the size of the 21st-century town. By the time Shabeni was 27, he was an established merchant in his hometown of Tetuan. He made a two-year pilgrimage to Mecca and thus became a hajji, Asseed El Hage Abd Salam Shabeeny. Returning from a trading voyage to Hamburg, he was captured by a ship manned by Englishmen but sailing under a Russian flag, whose captain claimed that his Imperial mistress (Catherine the Great) was "at war with all Muselmen" (see Russo-Turkish War (1787–1792)). He and the ship he had been sailing in were brought to Ostend in Belgium in December 1789 but the British consul managed to get him and the ship released. He set off again in the same ship, but the captain, who claimed to be afraid of his ship being captured again, set him ashore in Dover. In England his story was recorded. Shabeeni gave an indication of the size of the city in the second half of the 18th century. In an earlier passage, he described an environment that was characterized by forest, as opposed to nowadays' arid surroundings. ^ UNESCO World Heritage Centre. "UNESCO World Heritage Centre – Creation of a Special Fund for the Safeguarding of Mali's World Heritage sites". Whc.unesco.org. Retrieved 2014-05-16. ^ Medupe, Rodney Thebe; Warner, Brian; Jeppie, Shamil; Sanogo, Salikou; Maiga, Mohammed; Maiga, Ahmed; Dembele, Mamadou; Diakite, Drissa; Tembely, Laya; Kanoute, Mamadou; Traore, Sibiri; Sodio, Bernard; Hawkes, Sharron (2008). "The Timbuktu Astronomy Project". In Holbrook, Jarita; Medupe, R. Thebe; Urama, Johnson O. African Cultural Astronomy. Astrophysics and Space Science Proceedings. p. 179. doi:10.1007/978-1-4020-6639-9_13. ISBN 9781402066399. ^ Walt, Vivienne. "Timbuktu's Ancient Libraries: Saved by Locals, Endangered by a Government". Time. ISSN 0040-781X. Retrieved 2018-04-23. ^ Zanganeh, Lila Azam (2013-01-29). "Has the Great Library of Timbuktu Been Lost?". The New Yorker. ISSN 0028-792X. Retrieved 2018-04-23. ^ "BBC Radio Devon DJ David Lowe loses job over racist word". BBC News. 2014-05-11. ^ Sweney, Mark (2012-06-26). "ITV feels the heat over N-word song lyrics". The Guardian. Cleaveland, Timothy (2008), "Timbuktu and Walata: lineages and higher education", in Jeppie, Shamil; Diagne, Souleymane Bachir, The Meanings of Timbuktu (PDF), Cape Town: HSRC Press, pp. 77–91, ISBN 978-0-7969-2204-5 . James Grey Jackson (1820), An Account of Timbuctoo and Housa, Territories in the Interior of Africa By El Hage Abd Salam Shabeeny, London: Longman, Hurst, Rees, Orme, and Brown CS1 maint: Multiple names: authors list (link). Jeppie, Shamil (2008), "Re/discovering Timbuktu", in Jeppie, Shamil; Diagne, Souleymane Bachir, The Meanings of Timbuktu (PDF), Cape Town: HSRC Press, pp. 1–17, ISBN 978-0-7969-2204-5 . Levtzion, Nehemia (1973), Ancient Ghana and Mali, London: Methuen, doi:10.5555/AL.CH.DOCUMENT.sip100013 (inactive 2019-02-22), ISBN 978-0-8419-0431-6 . Link requires subscription to Aluka. McIntosh, Susan Keech; McIntosh, Roderick J. (1986), "Archaeological reconnaissance in the region of Timbuktu", National Geographic Research, 2: 302–319 . Miner, Horace (1953), The primitive city of Timbuctoo, Princeton University Press, doi:10.5555/AL.CH.DOCUMENT.sip200008 (inactive 2019-02-22) . Link requires subscription to Aluka. Reissued by Anchor Books, New York in 1965. McIntosh, Roderick J. (2008), "Before Timbuktu: Cities of the elder world", in Jeppie, Shamil; Diagne, Souleymane Bachir, The Meanings of Timbuktu (PDF), Cape Town: HSRC Press, pp. 31–43, ISBN 978-0-7969-2204-5 . Azawad (Tuareg: ⴰⵣⴰⵓⴷ, Azawad; Arabic: أزواد‎, ʾĀzawād) is the name given to northern Mali by Berber Touareg rebels, as well as a former short-lived unrecognised state. Its independence was declared unilaterally by the National Movement for the Liberation of Azawad (MNLA) in 2012, after a Tuareg rebellion drove the Malian Army from the region. It rejoined Mali in February 2013, after less than a year of unrecognized independence. Azawad, as claimed by the MNLA, comprises the Malian regions of Timbuktu, Kidal, Gao, as well as a part of Mopti region, encompassing about 60 percent of Mali's total land area. Azawad borders Burkina Faso to the south, Mauritania to the west and northwest, Algeria to the north and northeast, and Niger to the east and southeast, with undisputed Mali to its southwest. It straddles a portion of the Sahara and the Sahelian zone. Gao is its largest city and served as the temporary capital, while Timbuktu is the second-largest city, and was intended to be the capital by the independence forces.On 6 April 2012, in a statement posted to its website, the MNLA declared "irrevocably" the independence of Azawad from Mali. In Gao on the same day, Bilal Ag Acherif, the secretary-general of the movement, signed the Azawadi Declaration of Independence, which also declared the MNLA as the interim administrators of Azawad until a "national authority" could be formed. The proclamation was never recognised by any foreign entity, and the MNLA's claim to have de facto control of the Azawad region was disputed by both the Malian government and Islamist insurgent groups in the Sahara. At this time, a rift was developing with the Islamists. The Economic Community of West African States, which refused to recognise Azawad and called the declaration of its independence "null and void", warned it could send troops into the disputed region in support of the Malian claim.Tuareg military leader Moussa Ag Achara Toumane affiliated with the MSA (French: "Movement pour le Salut de l'Azawad"; English: "Movement for the Salvation of Azawad") was interviewed by the French language news outlet "TV5MONDE," during its "Le journal Afrique" or "African Journal" segment, about hostile events that occurred between the MNLA and other separatist groups against jihadi extremists in 2012. He claimed that jihadi groups, and the Ansar Dine in particular, had been in the region of Azawad for 10 years before the circumstances which led to the Azawadi Declaration of Independence. Locals had heard of their extremist views (in respect to shari'a law) then subsequently distanced themselves from the jihadis. Ag Toumane further asserted that the death of Col. Mu'ammar el Gaddafi destabilised the political landscape for sahelians from Mali and Niger to such a degree that it was described as "disastrous." The Tuareg rebels allegedly went into a "survival mode" for 5 years after his death which were fraught with socio-political and socio-economic crises. Disorganised and unaware of moderate militias, some joined jihadi groups but left when acquainted with better options; they aimed to join movements that were "good" in nature and organised for humanitarian causes for the betterment of Azawad. When asked about the speculated alliance between the MNLA and the Ansar Dine, Ag Toumane said he "personally did not know of the alliance" and referred back to the distance Azawadi locals kept from them.On 14 February 2013, the MNLA renounced its claim of independence for Azawad and asked the Malian government to start negotiations on its future status. The MNLA ended the ceasefire in September of the same year after government forces reportedly opened fire on unarmed protesters. The Battle of Gao was fought between the National Movement for the Liberation of Azawad (MNLA) and the Islamist Movement for Oneness and Jihad in West Africa (MOJWA), along with its ally Ansar Dine, that took place in Gao between 26–28 June 2012. followed the next day, with more fighting. By the 28th June 2012, Gao, Timbuktu and Kidal, the three biggest cities in the disputed secessionist region of Azawad within what is recognised as Malian territory, were under the control of Ansar Dine and its Islamist allies. suggesting it could send an armed intervention force into the country and the International Criminal Court (ICC) following Mali's lead in terming the acts as "war crimes." While MNLA also criticised the Islamists for holding civilians and destroying the structures, Ansar Dine said that the destruction was due to violation of sharia and in reaction to UNESCO's labeling of the sites of Timbuktu and in Gao as "in danger." The Battle of Timbuktu occurred in Timbuktu, Mali, in March 2013, between Islamist groups and Mali government forces supported by France. On the night of 20–21 March, a group of Islamist militants tried to infiltrate the airport. A car with armed men also tried to break into the city; however, French and Malian forces pushed them back. Between Time and Timbuktu is a television film directed by Fred Barzyk and based on a number of works by Kurt Vonnegut. Produced by National Educational Television and WGBH-TV in Boston, Massachusetts, it was telecast March 13, 1972 as a NET Playhouse special. The television script was also published in 1972, illustrated with photographs by Jill Krementz and stills from the television production. The script was primarily written by David Odell, with contributions from Bob Elliott and Ray Goulding, and the film's director. Vonnegut himself served as an "advisor and contributor to the script." Kabara is a small town in Mali on the Niger River, the port for Timbuktu. It is 8 km (5 mi) to the south of Timbuktu and is connected to an arm of the Niger River by a 3 km (2 mi) canal. The town has at times in the past been linked to Timbuktu by an extension of the canal. However, silting and lower water levels in recent years have made the extension canal unusable and the Kabara port usable only during the high water seasons. Musa I (c. 1280 – c. 1337) or Mansa Musa was the tenth Mansa, which translates to "sultan", "conqueror", or "emperor", of the wealthy West African Islamic Mali Empire. At the time of Musa's rise to the throne, the Malian Empire consisted of territory formerly belonging to the Ghana Empire in present-day southern Mauritania and in Melle (Mali) and the immediate surrounding areas. Musa held many titles, including "Emir of Melle", "Lord of the Mines of Wangara", "Conqueror of Ghanata", and at least a dozen others. Mansa Musa conquered 24 cities, each with surrounding districts containing villages and estates. During his reign, Mali may have been the largest producer of gold in the world; it was at a point of exceptional demand for the commodity. One of the richest people in history, he is known to have been enormously wealthy; reported as being inconceivably rich by contemporaries, Time magazine reported: "There's really no way to put an accurate number on his wealth." In March 2019 the BBC described him as "the richest man of all time". On 22 March 2012, President Amadou Toumani Touré was ousted in a coup d'état over his handling of the crisis, a month before a presidential election was to have taken place. Mutinous soldiers, calling themselves the National Committee for the Restoration of Democracy and State (CNRDR), took control and suspended the constitution of Mali. As a consequence of the instability following the coup, Mali's three largest northern cities—Kidal, Gao and Timbuktu—were overrun by the rebels on three consecutive days. On 5 April 2012, after the capture of Douentza, the MNLA said that it had accomplished its goals and called off its offensive. The following day, it proclaimed the independence of northern Mali from the rest of the country, renaming it Azawad.The MNLA were initially backed by the Islamist group Ansar Dine. After the Malian military was driven from northern Mali, Ansar Dine and a number of smaller Islamist groups began imposing strict Sharia law. The MNLA and Islamists struggled to reconcile their conflicting visions for an intended new state. Afterwards, the MNLA began fighting against Ansar Dine and other Islamist groups, including Movement for Oneness and Jihad in West Africa (MOJWA/MUJAO), a splinter group of Al-Qaeda in the Islamic Maghreb. By 17 July 2012, the MNLA had lost control of most of northern Mali's cities to the Islamists.The government of Mali asked for foreign military help to re-take the north. On 11 January 2013, the French military began operations against the Islamists. Forces from other African Union states were deployed shortly after. By 8 February, the Islamist-held territory had been re-taken by the Malian military, with help from the international coalition. Tuareg separatists have continued to fight the Islamists as well, although the MNLA has also been accused of carrying out attacks against the Malian military.A peace deal between the government and Tuareg rebels was signed on 18 June 2013, however on 26 September 2013 the rebels pulled out of the peace agreement and claimed that the government had not respected its commitments to the truce. Fighting is still ongoing even though French forces are scheduled for withdrawal. A ceasefire agreement was signed on 19 February 2015 in Algiers, Algeria, but sporadic terrorist attacks still occur.This conflict officially ended with the signing of a peace accord in the capital on 15 April 2015. The Battle of Timbuktu was a phase of the Northern Mali conflict, taking place in late March 2013, in which two Islamist attacks targeted the Malian army in Timbuktu. With help from the French, both attacks were prevented from capturing any significant sites in the city. The Songhai Empire (also transliterated as Songhay) was a state that dominated the western Sahel in the 15th and 16th century. At its peak, it was one of the largest states in African history. The state is known by its historiographical name, derived from its leading ethnic group and ruling elite, the Songhai. Sonni Ali established Gao as the capital of the empire, although a Songhai state had existed in and around Gao since the 11th century. Other important cities in the empire were Timbuktu and Djenné, conquered in 1468 and 1475 respectively, where urban-centered trade flourished. Initially, the empire was ruled by the Sonni dynasty (c. 1464–1493), but it was later replaced by the Askia dynasty (1493–1591). During the second half of the 13th century, Gao and the surrounding region had grown into an important trading center and attracted the interest of the expanding Mali Empire. Mali conquered Gao towards the end of the 13th century. Gao would remain under Malian hegemony until the late 14th century. As the Mali Empire started to disintegrate, the Songhai reasserted control of Gao. Songhai rulers subsequently took advantage of the weakened Mali Empire to expand Songhai rule. Under the rule of Sonni Ali, the Songhai surpassed the Malian Empire in area, wealth, and power, absorbing vast areas of the Mali Empire and reached its greatest extent. His son and successor, Sonni Bāru (1492–1493), was a less successful ruler of the empire, and as such was overthrown by Muhammad Ture (1493–1528; called Askia), one of his father's generals, who instituted political and economic reforms throughout the empire. A series of plots and coups by Askia's successors forced the empire into a period of decline and instability. Askia's relatives attempted to govern the empire, but political chaos and several civil wars within the empire ensured the empire's continued decline, particularly during the brutal rule of Askia Ishaq I (1539–1549). The empire experienced a period of stability and a string of military successes during the reign of Askia Daoud (1549–1582/1583). Ahmad al-Mansur, the Moroccan sultan at the time, demanded tax revenues from the empire's salt mines. Askia Daoud responded by sending a large quantity of gold as gift in an attempt to appease the sultan. Askia Ishaq II (1588–1591) ascended to power in a long dynastic struggle following the death of Askia Daoud. He would be the last ruler of the empire. In 1590, al-Mansur took advantage of the recent civil strife in the empire and sent an army under the command of Judar Pasha to conquer the Songhai and to gain control of the Trans-Saharan trade routes. After the disastrous defeat at the Battle of Tondibi (1591), the Songhai Empire collapsed. The Dendi Kingdom succeeded the empire as the continuation of Songhai culture and society. The Songhay or Songhai languages ([soŋaj] or [soŋoj]) are a group of closely related languages/dialects centred on the middle stretches of the Niger River in the West African countries of Mali, Niger, Benin, Burkina Faso and Nigeria. In particular, they are spoken in the cities of Timbuktu and Gao. They have been widely used as a lingua franca in that region ever since the era of the Songhai Empire. In Mali, the government has officially adopted the dialect of Gao (east of Timbuktu) as the dialect to be used as a medium of primary education.Some Songhay languages have little to no mutual intelligibility between each other. For example, Koyraboro Senni, spoken in Gao, is unintelligible to speakers of Zarma in Niger, according to Ethnologue. However, Songhay, Zarma and Dendi have high mutual intelligibility within Niger.For linguists, a major point of interest in the Songhay languages has been the difficulty of determining their genetic affiliation; they are commonly taken to be Nilo-Saharan, as defined by Greenberg in 1963, but this classification remains controversial. Linguist Gerrit Dimmendaal (2008) believes that for now it is best considered an independent language family. Roger Blench argues that the Songhay and Saharan languages form a Songhay-Saharan branch with each other within the wider Nilo-Saharan linguistic phylum.Historically, the name Songhay was neither an ethnic nor a linguistic designation, but a name for the ruling caste of the Songhai Empire. Under the influence of French language usage, speakers in Mali have increasingly been adopting it as an ethnic self-designation; however, other Songhay-speaking groups identify themselves with other ethnic terms, such as Zarma (Djerma) or Isawaghen. A few precolonial poems and letters composed in Songhay and written in the Arabic script exist in Timbuktu. However, Songhay is currently written in the Latin script. Tamasheq is a variety of the Tuareg languages. It is spoken by the Tuareg people, principally in the Timbuktu area. There are two divergent dialects: Timbuktu (Tombouctou, Tanaslamt) and Tadghaq (Kidal), in Mali. Tamasheq as spoken in northeastern Burkina Faso is similar.The name Tamasheq is sometimes applied to the Tuareg languages in general. First published in 1816, The Narrative of Robert Adams is the story of the adventures of Robert Adams, a twenty-five-year-old American sailor who claimed to be enslaved in North Africa for three years, from 1810 to 1814, after surviving a shipwreck. He was said to have finally been ransomed by the British Consul, where he eventually made his way to London. It was there that, as a random beggar on the streets, he was "discovered" by the Company of Merchants Trading to Africa, where he narrated the full details of his adventure.Adams claimed to have visited Timbuktu during his enslavement, which would have made him the first Westerner to reach the city. Upon his stated liberation, and return to Europe, Adams' story was published in two heavily edited and divergent accounts, most notably The Narrative of Robert Adams. glaring absurdities. "Often cited as an example of white slavery, today Adams' story is widely known to have been fabricated, lending to the dismissal of his story within general history discussions and recordings. Timbuktu! is a musical, with lyrics by George Forrest and Robert Wright, set to music by Borodin, Forrest and Wright. The book is by Luther Davis. It is a resetting of Forrest and Wright's musical Kismet. The musical is set in 1361, in Timbuktu, in the Ancient Empire of Mali, West Africa. Timbuktu is a 1959 American black-and-white adventure film directed by Jacques Tourneur and starring Victor Mature and Yvonne de Carlo. It is set in Timbuktu (Africa), but was filmed in the Coral Pink Sand Dunes State Park in Kanab, Utah. Timbuktu is a 2014 French-Mauritanian drama film directed by Abderrahmane Sissako. It was selected to compete for the Palme d'Or in the main competition section at the 2014 Cannes Film Festival. At Cannes, it won the Prize of the Ecumenical Jury and the François Chalais Prize. It was nominated for the Academy Award for Best Foreign Language Film at the 87th Academy Awards, and has been nominated for the BAFTA Award for Best Film Not in the English Language at the 69th British Academy Film Awards. It won Best Film at the 11th Africa Movie Academy Awards. The film was named the twelfth "Best Film of the 21st Century So Far" in 2017 by The New York Times.The film looks at the brief occupation of Timbuktu, Mali by Ansar Dine. Parts of the film were influenced by a 2012 public stoning of an unmarried couple in Aguelhok. It was shot in Oualata, a town in south-east Mauritania. Timbuktu is an old crater on Mars, located in the Margaritifer Sinus quadrangle (MC-19) region at 5.7° S and 37.6° W. It measures approximately 66 kilometers in diameter and was named after the ancient city of Timbuktu in Mali, Africa. Jason Michael Bosak Diakité (born 11 January 1975 in Lund), known under the stage name Timbuktu, is a Swedish rapper and reggae artist. In the mid-1990s, he started as part of the rap group Excel before going solo as Timbuktu. He has won several Grammis awards, the highest music awards in Sweden, including Lyricist of the Year and best Hip-hop Record of the Year. Timbuktu Cercle is an administrative subdivision of the Tombouctou Region of Mali. It is the largest cercle by area in the whole of Mali. The capital lies at the city of Timbuktu. The cercle is divided into Rural and Urban Communes, and below this, quarters/villages. In the 2009 census the cercle had a population of 124,546. 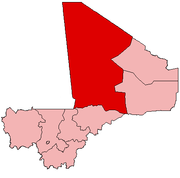 Tombouctou Region is one of the administrative regions of Mali. It is the largest of Mali's eight regions and includes a large section of the Sahara Desert. For administrative purposes, the region is subdivided into five cercles. Tombouctou region is world-famous for its capital, the ancient city Timbuktu (French: Tombouctou), synonymous to 19th-century Europeans as an elusive, hard-to-reach destination. The city gained world fame in 1390 when its ruler, Mansa Musa, went on a pilgrimage to Mecca, stopping with his entourage in Egypt and dispensing enough gold to devalue the Egyptian currency. This started the legend of a city in the interior of Africa, where roads were said to be paved with gold and buildings topped with roofs of gold.